barbie Princess Charm School!. . 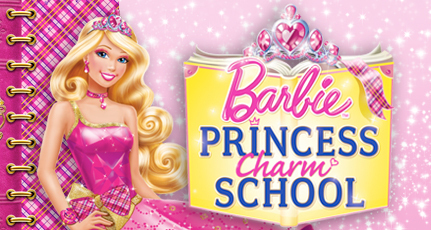 Wallpaper and background images in the film barbie club tagged: barbie princess charm school. I loved the dress, only that I think the bodice of her dress was a bit like the Barbie Fashion Fairytale. I like all, except for her story. where did you found it! ABC, check out Lyssa's wall post. There it is. Viva! Miss Major liked it- it has a hope to be good! Lorinna more because you did not like the story. Well my opinion is a beautiful film that will talk about preserving the environment, in addition there will be a school princess, princess with several of the world. So, I'll answer you, dear Brazilian friend, even I can't understand some words by you. Opinions, opinions, opinions...Someone thinks, that pink'n'glam'n'fashionable'n'Kaarinian movie will be cool. Someone thinks, that it would be better if it will be light pink'n'funny'n'classic'n'non-fashionable'n­'ol­dsc­hoo­l'n­'Sh­eri­dan­ian movie. It's a question of tastes! Someone likes modern movies because of their fashionablity, someone likes modern movies only because they have "Barbie" in the title. Well; it's a second Thumbelina. OMK movies with hidden reason are so sudden in Bms series. But movie about school...already was. Without princess, but with original Barbie- Barbie Diaries. And it will be second BD with princess and another name of protagonist. I like the image, not the story. It looks like a cross between the images from Christmas Carol and Three Musketeers. All though recently the Barbie movies are very modern, and like you I also do miss the classic movie Barbie as The Nutcracker, Rapunzel, Swan Lake, Princess and Pauper and others. Plus you really do not like the modern style of the new movies? For example, The Fashion Fairytale Barbie is a beautiful film that shows our inner glow, and is modern. Okay everyone has their opinion, the more I can say with certainty min for all Barbie movies are great, whether modern or not. Oh Ma Kellysh LOL! I knew it! I knew that Abbey will never changed her mind about modern movies! But lol, Blair looks like Corinne a little...for me, or not only for me? Dear Friend erysinho (I think I met this username somewhere already...). Of course, I miss classical movies, because of their not-so-bright colors, their sense and their Kelly Sheridan! Newer movies, especially FF, are bright fuchsia colored, full of fashion and sparkles and has Kaarina as voice actress! Of course, I'm not a hater of FF, I like Alecia (because she's younger Kelly Sheridan), I like aunt Millie, I like Sequin, and anothers- except Barbie, Teresa and Ken X_X (no, maybe Ken is nice a little- but not aliens Barbie and Teresa!) Yes, it has some sense- that every shy girl can find her star. And Barbie shown as fashion girl- true Barbie, not that shy village girl, or nice princess, or cute fairy (why Kelly Sheridan uses scenes from F and P&P in her voice acting movies? Because these movies are classical!). And last thing (I know, you're already tired to read my comment): when I watch Barbie movies, I have a feeling of fly (funny or not, it is). When I watch FF- I feel it only when Barbie isn't on screen. It means, soon they'll be more Hannish-Montanish, than most Hannah Montana. hmm .. Okey I agree with erysinho and Lorinna too! because I think mattel know , we like a classic movie than Modern movie! And in my humble opinion- Mattel doesn't look on our wishes. They want only for profit. But I'll be as Kelly- if it will be modern movie, I'll look it in WWW and publish full version on *LorinnaS*. but if Mattel want profit they should look on our wishes too.! It's one thing that I really want to need it ! If they're look on our wishes, they should make as well three sequels: for N, as Abbey wishes, for P&P, as Lyssita wished, and for 12DP, as I wish always! And I know- there're more wanted sequels. But Mattel continuing to make modern movies...sadness. Oh ma Kelly, Buckinghurst kingdom sounds much better than Gloss Angeles (it sounds for me like Buckingham). And, if there'll be prince, PLEASE, MATTEL, DON'T MAKE HIM LIKE ZANE!!! Of course...remember Kelly's post? "I was fired because of wanted modernity and fashionability of newer movies". I really to know why Mattel doesn't make a classic movie! Yes! Probably, when modern movies will be not in fashion trend, they'll return Kelly and classic movies. Lol! But if they'll do, I'll kill them myself! But I want a old time kingdom movie! Not a modern kingdom! Rawr! Why can't Mattel listen! Lol Lyssita! We're so talkative! lol my Kelly. Oh Ma Kelly, very true! Mattel doesn't even want to hear its fans' opinions. Rawr! we have 2 bla1r on these mov1es!!! Their personalities were wrong to. Excuse me, dear hauntedtower, but what did you mean by asking about C and Tay's voices? They're the same. ^Duh, it's coming only in end of August, how can anybody watch it? Sorry Lyss! But you know, what I'm thinking about Lindas. EM FASHION FAIRYTALE TERESA AND GRAÇE AND RAQUELLE SAO AS BEST OF MOVIE!!!!! OU SEJA I NO LATO COMO YOU NE? SUA BABACA! She says, that me are talking the language of animals. Dear GabiRabiAbuDabi, that's a language of Beatles, so shut up. Oh, and you're idiot here, not me. Nobody cares for your comments with CapsLock and for your idiotic opinion. Please die. ^^Yes! I agree with you Miss McCartney. Do you agree with goo-goo-g-job, Miss Lennon with the amazing redhead Johnny on userpic? I agree with everything you've said about this blue meanie of a newbie. I'll agree with everything you saying because of Johnny. If the Beatles are Gods, then, Johnny is main one. I love blair and her friends.she and her friends are so beutiful. Hello guys! rockin web! Would you pls enter Barbie Rks it might not come so press search everything thanx guys !!! !